Have You Seen Maytag’s New Jackets? Maytag is one of our favorite companies to work with on account of their priorities. They understand that it takes more than a good efficiency rating and a low price point to make a great piece of equipment. Don’t get me wrong, in terms of efficiency and value, Maytag units are excellent, but those aren’t the only areas in which they excel. A major part of Maytag’s design strategy is to provide lasting value for homeowners in the form of durability and reliability. To that end, the new Maytag condenser jacket improves drainage and reduces the chance of warping. Of course, should something happen, these units are covered by Maytag’s superlative 12-year warranty. The new design even reduces operational noise levels. Maytag’s priorities aren’t solely aligned with end users, though. They also pay special attention to how they can improve the experience for contractors as well. With this new jacket, you can expect improved accessibility during installation and service calls thanks to the new removable panels on each side and corner posts. 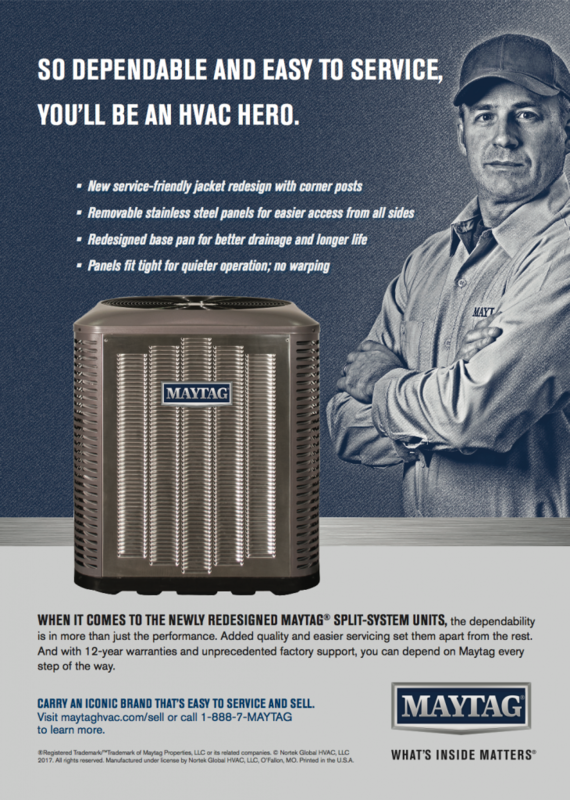 Check out the Maytag flyer advertising these advancements below! RSVP Today for May 4th’s ecobee Dealer Training Event!